Kids will strive to do their best if they enjoy the activity and will learn self-discipline in the process. This will follow them throughout their lives. Discipline in the martial arts does not mean making a child do knuckle push-ups for misbehaving in class. I am not a supporter of using exercise for punishment anyway. No, what we are talking about here is self-discipline. Discipline is all about doing what you must do even when you don’t want to do it. Training and control of oneself and one’s conduct, usually for personal improvement. the act of disciplining or power to discipline one’s own feelings, desires, etc., esp with the intention of improving oneself. How does a child learn to control his temper and not lash out? A good role model that he or she looks up to can be a big help. If the sensei says it’s not right to strike another child in anger, most kids take it on. I have even had many parents complain that their child did not hit back when they were attacked because “the sensei said it is not right to use karate at school”. Good or bad, this is self-control in its purest form. How do you get your child to get off the video games and get ready for karate class? Simple, the child has to like the activity. If you can make the classes fun and challenging at the same time, the child will be more likely to continue with it. How do you keep a child motivated? You have to break the goals into little chunks, because for a kid, six months is forever! Break the goals down into smaller chunks and reward them for their efforts more often. This is not bribery, this is just how kids operate. How do you get kids to practice at home? This is a hard one, but if the sensei suggests strongly that the child practice outside of class, and says he or she will “check your work next week”, a good many will. How can you get a bored child to concentrate? Play a game that requires the child to concentrate in order to win. Every child wants to win at games. Peer pressure can help as every child wants to fit in. “Yes I focus on that kata one more time because the rest of the class is doing it”. They start to learn how to concentrate on their own, enough to master the techniques that are required of them. How do you get children to do their best? Use the carrot, not the stick! We always make it a point to have a child demonstrate for the class a technique in which he or she is very good. It makes all the children in the class try harder. Kids are like any other human, we all crave recognition. As the child begins to achieve a sense of mastery, and this is recognised publicly, they start feeling a lot better about themselves and this is where they begin to really enjoy martial arts. Over a period of years students learn that if they persist, work hard, and do not give up, worthy goals are achieved. It is a lesson that will serve them well throughout their lives. 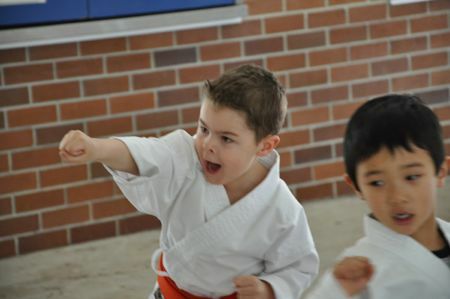 How has the martial arts helped your child’s self-discipline? Self-discipline is a skill that translates well into every area in life, and school is no exception. Martial arts can help calm and focus young minds while teaching them important skills. Thanks! Thanks Academy of Martial Arts for visiting and for your insights. Yes, it has certainly translated into every area of mine, with a few exceptions! In my response I talk about Self-discipline but I also talk about before I had Self-discipline and when my parents had to have Self-discipline for me, there were many a time I thought to myself it would be nice to stay at home, sleep in, watch TV or play games but it was actually the strength and resolve of my parents that kept me going (against my will sometimes) but with the help of a fantastic instructor and seeing the difference in my physical ability and confidence it eventually taught me that in life you sometimes must do things you don’t feel like doing at the time but in the end there is satisfaction accompanied by achievement if you persist. It was I believe the most single important lesson I have learned thus far and I contribute this to anywhere I have been successful with drive in my life. Of course if your child is not enjoying martial arts I’m not saying force them to go, there are something’s in life that ARE not negotiable like school or work and with that I believe along with the required tasks in life plus the more extracurricular activities (without over burdening of course) we can involve kids in and help them see through the self set goals they achieve the more chances they will have of their own to have the strength and resolve (i.e. SELF DISCIPLINE) to achieve anything they set their minds to. Hi Zoltan! You make a valid point here about the need for our parents to “be our self-discipline”. I think the difference in your case is that 95 percent of the time you were keen as mustard to go, the other times maybe needed a little break from all the activity. With others, if the parents have to beg their children to go week in and week out, perhaps that child needs to find another activity. Ultimately, the self-discipline needs to come from within and that is why so few stay the course. I have written another blog post about that. See Why You Are Not a Black Belt. It is a tribute to all our parents who encourage us to be our best. In your case your folks always took an active role supporting you and that made a huge difference. This is not always the case, unfortunately. It is gratifying for us instructors to see the improvements martial arts make in children’s lives, in your case physical and self-confidence. Thanks for commenting Zoltan. Yes there is Isiah, and even more fascinating and exciting teaching it! Thanks for visiting and commenting. I’d never really looked self-discipline like that. There are some things in here I could use on myself and not just the kids. thank u 4 posting that it’s, taught me alot like to not lose my temper around will and even though i don’t want to do my homework i should still do it and give 110%. it also taught me just do if it’s push ups i should do and with a smile on my face. Self-discipline applies to every part of my life. If I did not have any self-discipline, I would be lazy and not reach my goals, and achieve what I want to achieve. It takes self-discipline to reach goals. I have been practising my katas most of all because I am always enthusiastic to learn more katas and it is what I’m best at. I practise them at class and at home. Great article overall! Self-discipline is an important factor to everyone’s life and therefore should be taught at a young age. It has helped me be able to achieve many things (not only in karate) as it will with anyone else who takes it one board. Definitely worth reading. You are so right Flynn, it permeates your entire being. It is easy to be lazy, and in fact every so often necessary in order to re-charge, but what we do 90 percent of the time is what gets things done. Thanks for commenting. Very good point about the kata Elliot. They are the most complex and take the most practice to perfect, and hence build your self-discipline more than anything! Thanks for visiting us. Thanks Harry for your insights, we learn something new every day! Also very appreciative of your help with the little ones. Control of one’s emotions is the hardest thing, even for us guys that have studied martial arts our whole lives Jessica. I have to remind myself this every time a moron cuts me off in traffic! Thanks for participating in this conversation Jessica. And did you know that push-ups are easier with a smile on your face? Seriously. What Self discipline means to me is to resist when your body tells you to stop and pull through with your mind. As a parent, I have watched my children grow in self-discipline. There was a time when my twins wanted to give it all away. So we decided to have a term off. After coming back and using amazing self-discipline, hard work and commitment. They were able to reach their goal of being a junior Black Belt..
As a parent I am so proud of them both.. They have been extremely lucky to have such fantastic role members, whom are always there to help out and give a kind word. Great post, this makes me want to be more determined in my katas and to be a more efficient student in karate. Thanks Sensei Matt. Adam “The Machine” Loader! So great to have your presence on this blog tonight. So right Adam as most of our habits are developed when we are young. And as Sensei Zoltan so eloquently put it above in his comment, sometimes our parents provide the self-discipline for us when we are young. Glad it has made such a positive influence on your life Adam and thanks for visiting the blog! Hi Bianca! Great to see you here. Appreciate your comment and yes, it gives us great satisfaction when we achieve those “little goals”, because they add up to big ones! Hi James, I am glad to have helped you with your motivation today. The kata are the most difficult part of karate for most of us and take the most practice, but don’t give up. There are many students coming up behind you that are looking for your guidance. Thanks for commenting! Yes Will, it is mind over matter. This gets harder when you get older and sometimes need to listen to your body when it tells you to stop and have a rest. But I agree you should push yourself to be your best. Hi Melanie! So glad to get a parent’s viewpoint here. I think you were wise to give the kids a term off. I have seen this happen many times and in the vast majority of cases they realised how much they missed their karate, friends, and the lifestyle. And in most cases, came back with a renewed interest, just like your children. I congratulate them on having the drive to get their junior black belts, and you should be proud. Thanks for supporting our program! Thanks Daniel, and glad this post helped you in your motivation. Appreciate your comments. Interesting article, particuarly the point about the kids not retaliating because their sensei told them not too. Ultimately however Ive noticed that self discipline is up to the individual, I’ve seen some people with so many people pushing them to teach them a form of self discipline, not just in karate although I have noticed it with the younger kids a lot, that simply dont have the mindset to gain self discipline themselves and as such do not succeed. Hi Jacob, great to have you here on the blog! You bring up an interesting point, is there such a thing as too much pushing to teach self-discipline? And I believe the answer is yes, there is. At some point the self-discipline must come from within. Like my gridiron coach used to say “You have to want it men”. I like how he referred to us boys as men, as it emphasised the need to think for ourselves. Thanks for the great comment. I remember when I moved to Europe when i was 8 years old. I was a green belt at the time, and I did not return to Australia until I was 10. If it had not been for my father, who said I “HAVE to go back”, I would not be where I am today. However, my dad’s words only got me through to my black belt, then he gave me a choice; stay or leave. But I said no, I will stay. And now, I am a third degree black belt in what I consider to be one of the best Martial Arts Schools in Australia. And I have no inclination to stop. Thanks, Matt Klein and Zoltan Levitt for always pushing me to where I need to go and answering all of my, albeit sometimes painful, questions. We as students could not ask for a better support network. A fantastic post Matt, with some great points. I can honestly say alot of the self-discipline i have today i owe completely to my martial arts. All i can hope now is that i can help forward these life lessons onto new students and help them achieve what we have been lucky enough to. This description of self discipline is very insightful. Reflecting on the past, it allows me to re-live my time at karate as a younger self and seeing the positive effect it had on me as a Martial artist. Thank you for this information Sensei Matt. Great read Matt, self discipline really is important in everyones lives – especially us as martial artists. As Zoltan said above, sometimes you may not feel like going to karate, but it is often those times you get the most out of it. I know karate has definitely helped me with self discipline and its a great tool for the kids to learn too. Glad you enjoyed it Ben, you are so right about the times you do not feel like going to karate–I’ve had my best training days when I had to drag myself there. Thanks for your insights. Hi Grant, your story is an inspirational one, to get that far in the martial arts, and I have heard similar ones. It is an argument in favour of our parent’s pushing us a bit. In your case it certainly paid off. There will be plenty of time for sleep ins when you are old and weary Grant. Thanks for your kind words regarding our school, we take great pride in it. I assure you, your questions cause us no pain, and no such thing as a bad question! Hi Matt! Thanks for your comments, and yes, our mission is to carry on our good work and help the next generation improve their lives through the martial arts. Glad you have been part of this Matt. Hi Brad! So glad to be of help in your recollections. Sometimes it is a valuable exercise to look back and see how far we have come. It reminds us that we can handle darn near anything life throws at us. Thanks for your insights Brad. Firstly I must admit that I would not be writing anything if Zoltan had not said we need to read the blogs on the web site. I have a great deal of respect for Zoltan and if he says something is worth reading then I should read it. Thanks Zoltan, it was worth the read. As a parent I have been very lucky with my son Stephen. He has always wanted to go to karate, I have never had to force him, I attribute this to the great examples set by all the Sensei at karate. I think it is important as a parent that we make time for our families. If your children want to go to karate make sure you find the time to get them to class before it starts, show them a positive attitude (it does rub off). I really believe that your children benefit from you staying at the class and watching them, they might not always show it, but they do appreciate you making that time for them. Having said that I have watched Stephen’s self discipline improve as a direct result of his training. To the point now where he is motivate enough to attend and help out at a number of different venues. He often comes home tired in the evenings after classes, but next week he is back again for more. Personally I feel that I had a reasonable degree of self discipline before starting karate, just due to life experiences. And I didn’t have anyone telling me to turn up each week. But having worked for myself I know that if you want to achieve something then you have to do it. You do not get to achieve things by letting someone else do it for you. Others can help point you in the right direction, but ultimately it come back to yourself and having the self discipline to continue to strive to reach a goal. By guiding children to achieve goals they start to work out that they can improve themselves, reach targets and they are learning self discipline along they way. Thanks Matt for providing an environment where children can learn respect, control and self discipline. Hi Ivor! So glad to see you here, and yes, Zoltan’s judgement is worth listening to. You and Stephen have come a long way and it has been great to watch your progress as students and now as assistant instructors. That good tired feeling that you describe I can relate to that very well! It is a satisfying kind of tired. Thanks for your feedback Ivor. Hey, my name is Ryan Nicholas who attends the 11:15 class at Mona Vale. I believe that karate teaches great self discipline and also large amount of respect. I used to always sit on the computer, but i no longer stay on it as long as i used to, I make my self practise my katas and perform techniques. Kenpo freestyle karate has made me want to strive to achieve higher goals. I have recently started learning the eagle kata at a blue belt level (Going for green this term). I believe these are pure examples of self discipline and I strongly agree with this topic. Hi Ryan, I am happy we have been able to steer you away from the “scourge of the younger generations” with the joy of movement through our kata and techniques. It is so much more fun to be doing rather than watching. It is exceptional to be doing the Eagle kata as a blue belt, keep up the great work! Thanks very much for your insights.